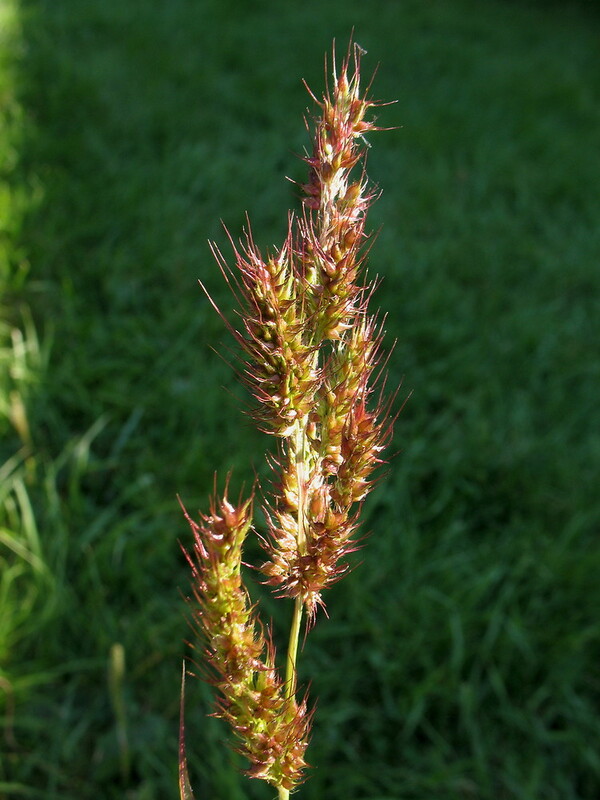 Echinochloa crus-galli. Creative Commons alienplantsbelgium.be (Accessed 4/2014). Echinochloa crusgalli var. 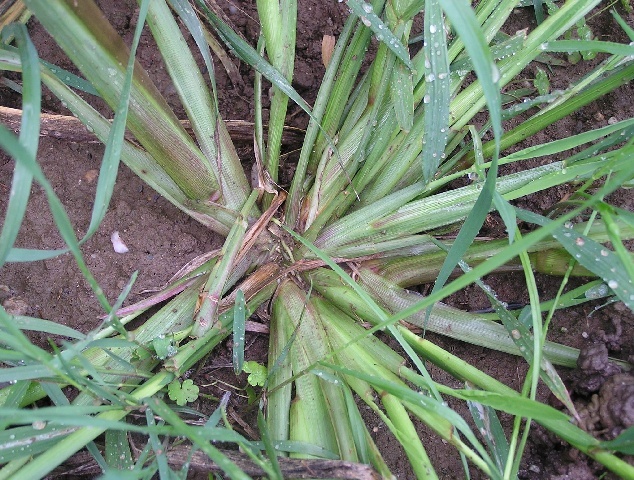 crusgalli is an annual, C4 grass (Charest and Potvin 1993), from fibrous roots that may extend over 1 m down and 1 m laterally; to 1.5 m tall, stout, tufted, branched from base; ligule absent, sheaths hairless, margins free, overlapping, membranous. Echinochloa crus-galli. stem and sheath. By Marilee Lovit. Copyright © 2018 Marilee Lovit. New England Wild Flower Society. gobotany.newenglandwild.org (Accessed 4/2018). Leaves hairless, 0.5-3 cm wide, 50 cm long, veins pale, conspicuous, leaf bases often red. Echinochloa crus-galli base of stems. uniprot.org (Accessed 4/2018). 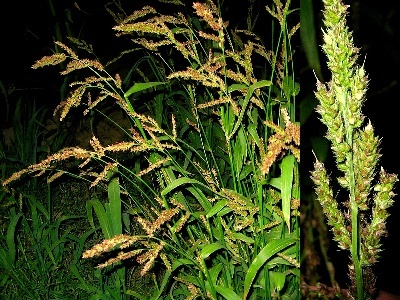 Flower spikelets in 2-4 rows along axis, purple, 0.3-0.4 cm, fat, hairy, crowded, often with awns to 2.5 cm long, glumes hairy, sterile lemma with finely hairy deciduous tip; inflorescence open, green to purplish, 10-25 cm long, branches 15-25, 2-4 cm long, densely covered with flowers, axis bearing warty-based bristles, often to 0.3 cm long or more, often red in flower. Self pollinated or outcrossing by wind pollination, late season flowers remain inside leaf sheaths. 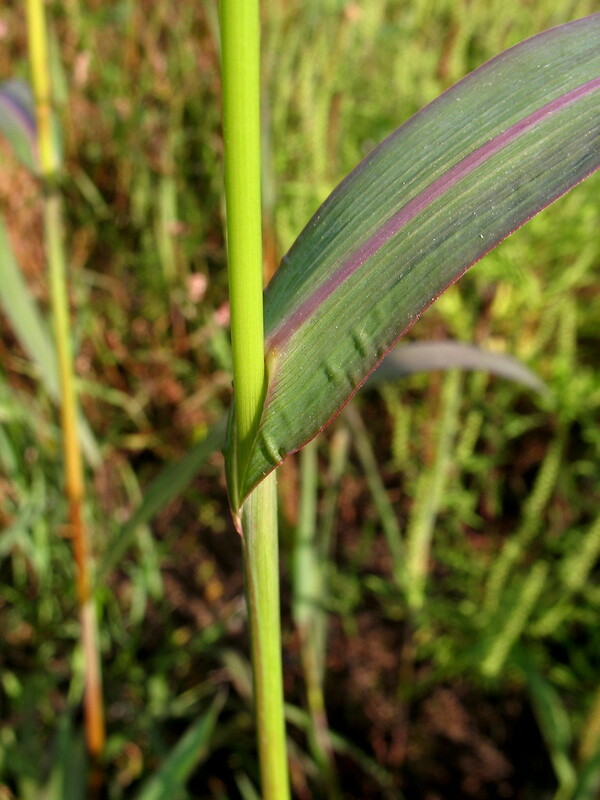 Echinochloa crus-galli. By Marilee Lovit inflorescences. Copyright © 2018 Marilee Lovit. New England Wild Flower Society. gobotany.newenglandwild.org (Accessed 4/018). Fruit dry, one-seeded.Seeds can float 4-5 days, also dispersed by birds and as a contaminant of crop seeds; innate dormancy of fresh seed broken by low winter temperatures; buried seed remains viable for at least 3 years but is not viable after 15 years (Charest and Potvin 1993; Maun and Barrett 1986). 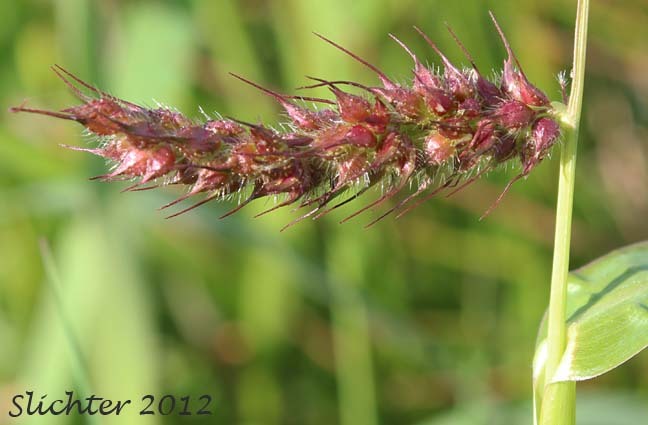 Seeds germinate in early summer, plants dies after seed production in Sept.-Oct.
Echinochloa crusgalli var. crusgalli spike. Paul Slichter 2012. science.halleyhosting.com (Accessed 4/2018). Habitat: Open, disturbed areas, lawn edges, moist or wet fill. Notes: Heavy user of nitrogen. Intolerant of shade and drought. Prefers fertile, moist to wet soil, can grow in saturated soil. Prefers temperatures of 16-25 ºC. Attacked by larvae of the weevil Hyperodes humilis (Coleoptera) and larvae of the army worm Pseudaletia unipunctata (Lepidoptera) and Infected by the fungi Drechslera dictyoides (Deuteromycotina), Tolyposporium bullatum and Ustilago crusgalli (Basidiomycotina) in the northeastern U.S.A. (Maun and Barrett 1986).